Magnet Commerce allows you to quickly import existing product databases into your storefront, by use of the import tab. It also lets you export all the products and any relative information (e.g. description, price, images and more) from your store, using the export tab. Magnet Commerce allows you to freely import existing product databases into your storefront, by use of the integrated import function. In order to do so, we recommend that you organise your data in a data feed file using a computer's spreadsheet program such as Microsoft Excel. Then you would simply upload this file to your e-store by using the "Import" functionality. To create a data feed file containing the data you wish to import, open a new file in your computer's preferable spreadsheet program. You can use a spreadsheet program, such as Microsoft Excel, Notepad or WordPad. We recommend that you use Microsoft Excel since it makes it easy to convert your file to the proper format. However, if you choose to go with a text editor, such as Notepad or WordPad, just make sure that every field is separated by only one tab when creating your file. The data feed to import must contain all products you want to import -one product per line. 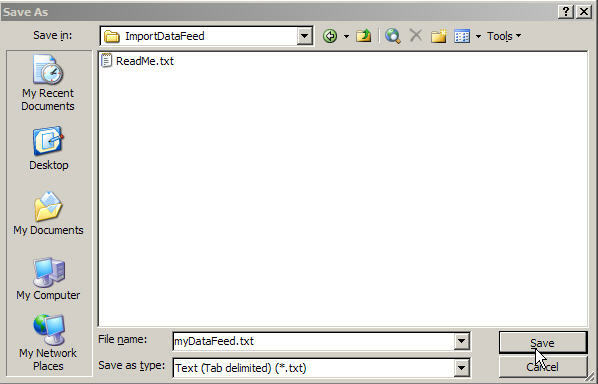 Figure: Creating the data feed file to import.
! Right click here and choose "Save Target As..." to download a template import file. Open the file in excell and add your products. If you want, you can try importing the file as it is, to see the new categories "skirts >>> summer skirts" and product "Armani beacj skirt" automatically added. Column A: (SKU) The unique product identification tag. Column B: (Name) The product's name or title as you would like it to appear on the product page. Column C: (Short description) The product's short description as you would like it to appear on pages listing categories and search results. Column D: (Long description) The product's long description as you would like it to appear on the product page. Column E: (Image URL) The full URL of the product image.
! Import only lets you upload one image per product. Column F: (Price) The product's price. Always use the dot "." as the decimal separator. Column G: (New price) The product's new price, should you need to include a discount. Column H: (Weight) The product's weight. Always use the dot "." as the decimal separator. Column I: (Stock) A number indicating the product tokens in stock. This can be 0 if the product is out of stock (or even a negative digit if backorders are allowed), or any positive digit for a limited product stock. Use a large number (e.g. 9999) for unlimited product stock. Column J: (Category) The category in which the product gets listed. If the category you are typing here doesn't exist, it will be automatically created when importing your datafeed. Be sure to use a ">" when separating category levels. For example "Music>iPod".
! if you want to import a product in the "iPod" category, which is a subcategory of the root category "Music", you need to type "Music>iPod" in the category field. If you only type "iPod", a new root category "iPod" will be created and the product will be listed under it. Figure: If you want to list a product in more than one category, you need to define every category in a different line. Apart from the J (category) column, all other info should be identical. Column K: (Filters) The product filter values, separated by commas. You should first create your product filters on your administration before assigning filters to products using the import function. Figure: Filters setup on your administration. The order set here is important when adding product filters automatically! "Sony,,$200-$500" in the filter field of your datafeed. Please note the absence of a filter value between the two commas which means that you are not assigning a "Memory" filter value to your product. For more on product filters please read here.
! From all previous fields, only "Name" is obligatory in order to import a product. However, when leaving out some fields make sure you use the right columns for the information you want to import. For example, if you only want to import "Name" and "Long Description", type the product names in column B, the descriptions in column D, and leave all other columns blank. Attention! If you don't specify a category (column J) for a product, it will get listed under the root category.
! You can change information of products (e.g. description, price etc.) that are already listed in your catalog using the import function. In order to overwrite a product, you need to define its exact name, SKU (leave blank if no SKU has been defined) and category (leave blank if product is listed under the root category) in the import file. Attention! If you leave undefined fields in the import file for existing products that have these fields set, the fields will be deleted. E.g. if you already have a product in you store with a long description, and you leave the long description field of that product empty in the import file, the existing description will be deleted from your store. An exception of this is column E (containing the product image). If this is blank, the product images will stay as they are. 1. Open the File menu in the top left corner and click on the "Save As..." tab. 2. Select Text (Tab delimited) (*.txt) from the "Save as type..." drop down menu. 3. Type the filename of the file that you want your data feed file to be saved as. 4. Click the Save button. If you see a warning window pop up, click the "OK" button. If you see a second warning message, click the "Yes" button. Figure: Saving the data feed file. Once you have saved your datafeed as described above, make a copy of this file, open the copy using notepad, save it using utf8 encoding and import it to your store using the information below. Please make sure you make a copy of your datafeed, as it is likely you won't be able to edit it again once you've saved it in utf8 encoding! Figure: Import the data feed file by choosing "Catalog > Import" in the Administration Panel. 1. Use the "Browse" button to locate the data feed file (alternatively you can type the file's full pathname in the text box provided). 2. Select the language tab in which your product will be added (This is import for multi-language shops only!). 3. Before importing your products you have the option of deleting all existing categories and/or products from your e-store. You can do this by ticking the respective check boxes provided. 4. Finally click the "Import" button to upload the data feed file. Figure: Import the data feed file. Once the data feed file has been successfully imported, you can check your storefront to view the imported files.
! The same order in which the products are listed in the datafeed file is used for adding them in categories and filters and for presenting them on the store's pages. Figure: "Music" category appearing on the storefront, after importing the aforementioned data feed file. 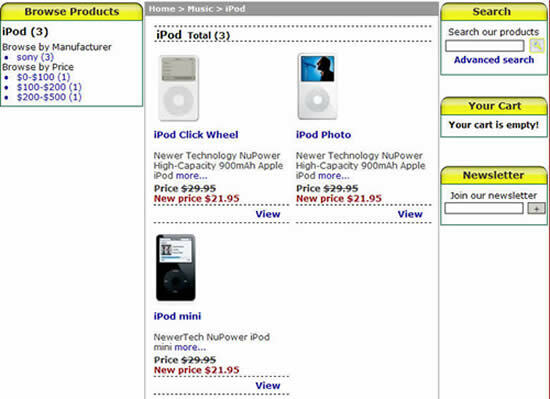 Figure: Contents of the iPod category appearing on the storefront. Figure: Choose "Catalog > Export" to get a file containing all your products. A pop up window will appear, informing you that the data feed file containing the exported products will be sent to you by email to your registered e-mail account(s) - the one(s) defined in the "Setup > General > Sales email" text box. Figure: A message will appear informing you that the feed file will be sent to you by email. Figure: The product export file as created by your Magnet Commerce store. Column A: (part) The unique product identification tag (SKU). Column B: (name) The product's name as it appears on the product page. Column C: (short description) The product's short description as it appears on pages listing categories and search results. Column D: (description) The product's long description as it appears on the product page. Column E: (image Src) The full URL of the product image. Column F: (price) The product's price. The dot "." is used as the decimal separator. Column G: (new price) The product's new price, if there is a discount. Column H: (stock) A number indicating the product tokens in stock. This is 0 if the product is out of stock (or even a negative digit if back orders are allowed), or any positive digit for a limited product stock. 9999 is used for unlimited product stock. Column I: (category) The category under which the product is listed. Note: The full path of the category in which the product belongs is listed. For example, if a product belongs to the "iPod" category, which is a subcategory of the root category "Music", the value of this field would be "Music>iPod"
Figure: If a product belongs to 2 categories, it will occupy 2 lines in the export file. The contents of the 2 lines will be identical, apart from the column showing the categories. Column J: (types) The product filter values, separated by commas. Note: The order of the filters here is important! Check the order of your filter groups on your administration ('Catalog > Product Filters' tab), to find out which filters these values refer to. Column J: (link URL) If you have added a redirect link on a product page, this link appears here. Redirect links are defined in the product presentation section of your administration. An example where you would use redirect links is for building a shopping catalog. In such a case you probably want your visitor to be redirected to the product seller's page once the product has been selected. To import product databases to an e-store, create a tab delimited data feed file and import it using the "Import" tab in the Administration Panel. To export products from an e-store, use the "Export" tab in the Administration panel. A data feed file containing the exported products will be sent to you by email. You can import products that already exist on your store, but keep in mind that the values of an existing product (e.g. description, price etc.) will be overwritten by the ones defined in your import file.